Job search book for military transition, military spouses and veterans. Are you a military spouse looking for a job outside the big cities? 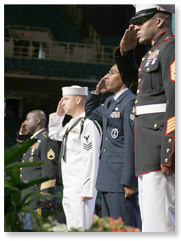 How about a member of the military transitioning to civilian life and looking for a job in private or public sector? Would you like access to a resource that cuts through all the clutter and confusion and brings you the job search strategies that you need. Provides realistic advice to speed your job search in the medium to smaller sized cities and towns. Details the online and offline job searching tools that will work best in these markets. Offers tips for creating a resume that gets the attention of employers. Gives you the scoop on dressing your best for interviews. Lays out the great resources that are available to you to speed your job search and lead you on the road to job success. Click here to learn how to order Job Searches Beyond the Big Cities today.